In this final section, I will discuss meditation equipment and accessories and I'll introduce you to some techniques for space clearing and energy cleansing. The following is just a short list of some additional items that you may wish to add to your meditation room to enhance your overall experience of meditation. The first item that springs to mind is a stereo system for playing meditation music or for listening to guided meditations. You might also like to keep some headphones handy too. You may wish to provide yourself with some meditation furniture, perhaps some simple bedding or a comfortable floor mat to lie on. It’s good practice to spend some time lying flat on your back after you have completed a meditation, so make sure that you have somewhere comfortable to do this. Please note that if you are designing a meditation room for commercial use and you intend to burn candles or incense in that space, you must ensure that a fire extinguisher is available. Better safe than sorry! If you are designing a meditation room and you are short on storage space, then you may also wish to introduce a small cupboard, side table, or even a small decorative box for storing candles, incense, matches, books...whatever you use on a day to day basis. I recommend that you do not dilute the purity of your meditation space by bringing a television into it. Remember that the point of a meditation room is to create a space that is focussed around the practice of meditation. It’s not a room for general recreation. Have you ever noticed how you can feel uplifted when you walk in to some rooms, and exhausted after you spend time in others? Have you ever noticed how some rooms feel stale, or have you ever sensed the tension that remains in a room after an argument? If so, then you will understand that the energy of a room can have a life of its own. 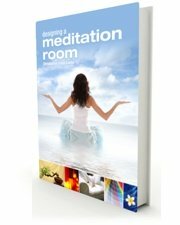 If you are designing a meditation room, there are a number of steps you can take to ensure that your room feels positive, uplifted and full of life. In fact, there are so many techniques that can be used for space clearing and energy cleansing that it is beyond the scope of this book to fully explore them all. In this section, I’ve included a few quick suggestions to start you thinking about clearing the energy of the space in which you meditate. Introduce positive sacred symbol(s) into your meditation room. You may use symbols from any healing modality that you are familiar with. Their positive vibrations help to prevent unwanted negative energies from collecting in your room. A certain calmness comes from the presence of nature’s gifts, and introducing a little foliage into your meditation room is an excellent way to add a sense of “life” to your space. It’s well known that plants cleanse the air by removing carbon dioxide and releasing pure oxygen. But apart from their effect on the quality of the air in your meditation room, many plants are said to have a positive effect on the energies around them, absorbing and transmuting negativity. Because plants can absorb energy from the space around them, the health and appearance of a houseplant may also indicate the health of the energy in a room. Cacti are often said to be excellent plants for protecting against negativity and for removing depressive energies, but almost any plant can contribute towards energy cleansing in you meditation room. Just be sure to introduce plants that will survive indoors and that are suitable for the light and temperature levels of your meditation room. There’s no faster way to degrade the pure loving space of a meditation room than the presence of a dying plant! Water is a symbol of cleansing and purity and it also symbolizes emotions. A glass or ceramic bowl that holds water can be used to purify energies in your meditation room. Replace the water regularly and consider “energizing” it by giving it some time to spend in sunlight. Add a bowl containing natural rock salt to your meditation room. It will absorb negative energies in much the same way as a bowl of water. Remember to replace the salt regularly, and do not use it for eating after it has served its purpose! It’s easy to forget to refresh the air in your meditation room. Open the windows and doors to your room once in a while, if not daily, to allow fresh air in and to allow any stagnant air to depart. Incense has been used in various spiritual ceremonies and as an everyday part of temple life for thousands of years. Burning incense is a great way to cleanse the energies in a room and prepare the space for meditation. Tibetan bells and singing bowls are popular instruments for clearing the energy in a meditation room. The sound vibrations they produce are very soothing and very effective at harmonizing and purifying the energy in a meditation room. Alternatively, you can enhance the energy in your meditation room by playing some meditation music. The positive effect that soothing meditation music has on the energy of a room is almost instant. It would be hard to complete an essay about meditation rooms without mentioning the word “crystal” somewhere along the way. Crystals are an immensely popular inclusion in meditation rooms, not only because of their various energetic properties, but also because they are so beautiful to look at. Aesthetics, functionality, atmosphere. We’ve now covered all the major aspects of designing a meditation room. As you digest and assimilate all this information, it’s important to keep in mind that your meditation room does not have to meet all of the recommendations laid out in these articles. All that is really important is that your meditation room becomes a space that you love to be in, even if it’s not “perfect”. When you dedicate a space to the practice of meditation, you imbue that space with a purity of purpose. The room itself becomes a sanctuary that is focussed around your intention to meditate. It is more than just a nice looking room; it is a place that encourages you to meditate with great depth. It is a place that symbolizes your desire to experience inner silence. The moment you walk into your meditation room, the purpose and meaning that you have assigned to it will reach out to you and remind you...it’s time to be at peace.